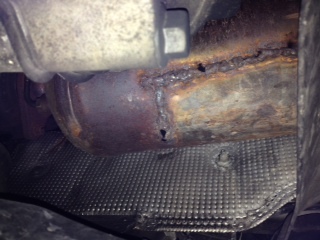 DPF removed - Issues and rights!? Hi all, firstly, new here but I just wanted to pick a few of the experienced heads brains on here as to where you guys think I stand with the following scenario I have found myself embroiled in. I purchased an Audi A4 S Line 170 in Sept 2013 from a trusted dealer in Leicester. Long story short I have had it back to them twice since purchase, once for pads and disks roaring within 7 days (not covered under warranty but replaced free of charge as a matter or courtesy). Secondly, after having driven the car for maybe 750 miles, I received the glow plugs fault light on the dash, car went into limp home mode and so naturally took it back to them. Turned out turbo was knackered and they also replaced this with a recon'd one, this time covered within my 28 day, 1000 mile warranty. When I took it back to them after receiving this fault (roughly Mid October last year) I also advised them of what sounded like a rattling/blowing noise towards the end of high revs and put this down to the same issue with the turbo. Yea equal rights for who? what to do and what are my rights? Quick Reply: DPF removed - Issues and rights! ?